We all wake up often feeling moody, tired or lethargic. We hit the snooze button hoping for a few more minutes of solid sleep but probably end up feeling even more sluggish immediately after. Life is stressful, no denying that. Anyone and everyone identifies with it. But even worse is not doing something to make things better. A resentful existence can lead to calamity, severe depression or something worse. It’s better to get a handle on things before they spiral out of control. That means finding a way to get out of your mental and physical slump and finding more meaning in life. What is the meaning of life? What do you want from your life? What makes you happy? How can you get more out of life? There are a lot of questions but nothing can happen until you motivate yourself to do something about it. That means increasing your mental and physical energy. You can’t perform at your best if you’re constantly fatigued. 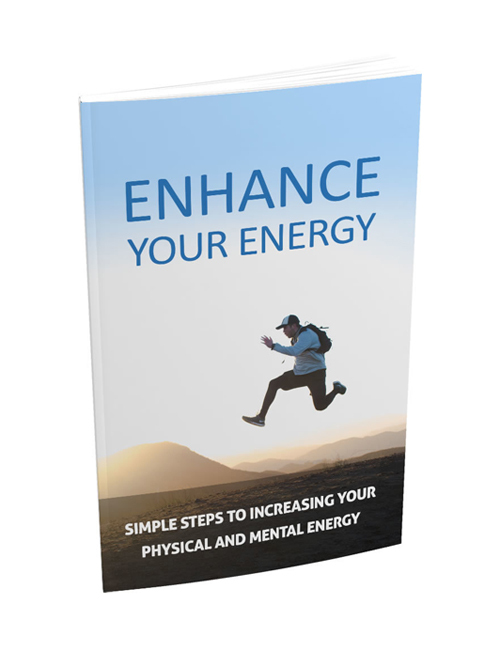 This guide will help you to identify what is causing your fatigue and how you can change things up to boost your energy levels and move towards becoming the person you want to be, both personally and professionally. You need to be in the right mindset and have the mental and physical energy to achieve the things you want in life. If you’re mentally exhausted or just can’t physically get to the task, life will go by like a flash. With this ebook, you will learn the reasons for your exhaustion and why it might be happening. You’ll also learn the various symptoms of mental and physical fatigue, how to change up your diet to elevate your energy levels, how to do a detox on your mind and body, the importance of physical activity, how to destress yourself and get your eyes on the prize and the things that matter most and much more. Enhance Your Energy will help get you on the right track so you can live the life you deserve. Get it now.